It can be complicated when comparing different companies quotes. Our loyal Mundaring customers love Cool Sparky, your local electrical & temperature specialists for over 50 years! 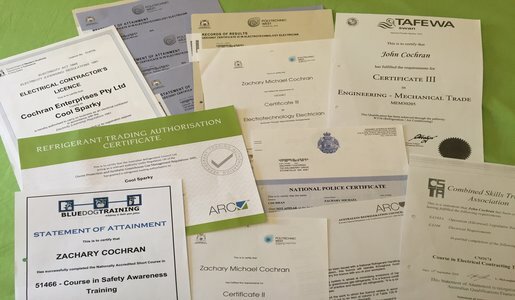 Our tradesmen hold dual qualifications. You only need to arrange one Cool Sparky tradesman for a complete air conditioner installation. You speak to the tradesmen direct, not a salesperson. Cool Sparky is an independent, unaffiliated supplier which allows us to offer you the best solution available. Our team uses the highest quality materials which always comply with Australian product standards. We are a family owned and operated business that prides ourselves on good old fashioned service. We use non toxic vermin deterrence when installing air conditioning. Over 50% of our repair work is attributed to rat and mice damage. (A common hills problem). We do not charge a delivery fee. Your home will be left clean and tidy. Our team of installers are fully qualified electricians and refrigeration mechanics who all hold blue card licences and police clearances. We provide a 2 year warranty on our installation work, along with the product warranty.